Astronaut Eugene A. Cernan, commander of the Apollo 17 lunar landing mission, participates in lunar surface extravehicular activity (EVA) simulation training under one-sixth gravity conditions aboard a U.S. Air Force KC-135 aircraft. 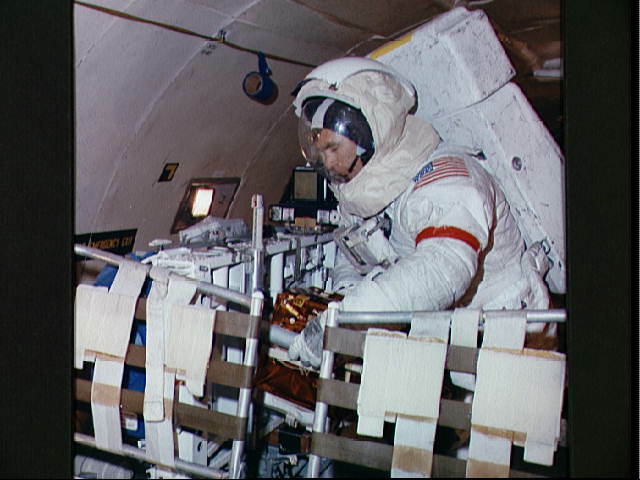 Here, Cernan simulates removing an experiment package from the aft end of a Lunar Roving Vehicle (50270); Astronaut Stuart A. Rossa, backup crew command module pilot of the Apollo 17 mission, participates in EVA simulation training aboard a U.S. Air Force KC-135 aircraft. A mock-up of the Scientific Instrument Module (SIM) bay of the Apollo 17 Service Module is used in the exercise. Here, Roosa simulates retrieving the film cassette of the Mapping Camera from the SIM bay (50271).